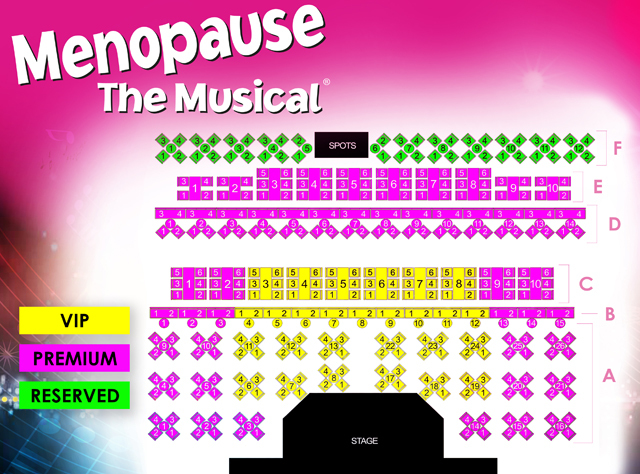 Playing in the heart of the Entertainment Capital of the World at Harrah's Las Vegas, Menopause The Musical is celebrating its ninth year in Sin City. The critically acclaimed show, which has been seen by more than 11 million people around the world, first debuted in Orlando, FL in 2001. In addition to playing in 15 different countries, the production has performed in more than 40 cities around the globe over the past 15 years. Your discount Las Vegas Menopause The Musical tickets offer you the opportunity to see the award-wining and hysterical show, which celebrates women who are going through the change, inside the intimate cabaret showroom at Harrah’s Las Vegas. Featuring an all female cast, the 90-minute production is set in the famous Bloomingdale's department store. A chance meeting among the four women occurs in the lingerie department when a tug-of-war breaks out over a black lace bra. Using reworked lyrics from some of the biggest hits from the '60s, '70s and '80s such as Aretha Franklin’s “Chain of Fools,” Rod Stewart’s “Hot Legs,” Peter, Paul & Mary’s “Puff the Magic Dragon” and more, the women parody everything that goes along with the “silent passage,” including hot flashes, loss of memory, chocolate cravings wrinkles and sexual dilemmas. Creating a sisterhood on stage and off as the women in the audience and the characters all share a common bond, Menopause The Musical appeals to women of all ages. Get your discount Las Vegas Menopause The Musical tickets today from VEGAS (the app) and see for yourself why the Baltimore Times Herald describes it as “hilarious, good fun and the perfect destination for a girls’ treat out.” All seating is assigned as next best available in the category purchased by the show box office.